It’s the last week of villain’s month and the latest issue of The Dark Knight is becoming the hardest to find 3-D cover. More importantly, it introduces us to Joker’s Daughter. Is she as twisted, insane and classy as her “father”? Find out after the jump! Previously in The Dark Knight: I haven’t been reading The Dark Knight, so I don’t know what’s been going on in the story. I did read the Ventriloquist issue and liked it. I went into this issue completely blind. I knew next to nothing about the Joker’s Daughter other than I believed she was from another Earth. But after reading this issue…I still feel I know next to nothing about the Joker’s Daughter. We’re shown her living in the sewers where escaped inmates of Arkham Asylum have formed a “tribe”, with the men running the show. Duela finds Joker’s face floating in the water, puts it on and decides it’s time for the women to lead. During her confrontation with the leader, she tells us her back-story. It’s here that the issue starts to lose traction. The problem lies both with the artwork and the writing. Duela is clearly warped, showing signs of mental illness by cutting her face and making corsets of barbed wire. The symmetry, if you will, between the Joker’s cutting of his face and Duela’s self-mutilation was clever. I thought the mental illness element of the issue was handled well with Duela’s reasoning for being a cutter realistic. The problem is that it’s not clear whether her illness stems from her natural state or emotional abuse. Her father is an obsessive perfectionist, as shown by his need for flower arrangements to be balanced, so when his daughter is born with a scar he is shocked. But, this was only clear after my second read. The scar is so small I didn’t notice it and was totally lost as to why Duela was forced to have surgery on her face, not to mention the absurdity that a surgeon wouldn’t sedate a patient for this procedure. Subtlety in storytelling is great, but details here are so subtle it hampers the reader’s understanding. When we see Duela’s father discard her dead dog because it was too ugly, we’re lead to believe he is the cause of her problems. Two panels before this though we see Duela with a bird hanging in a cage. 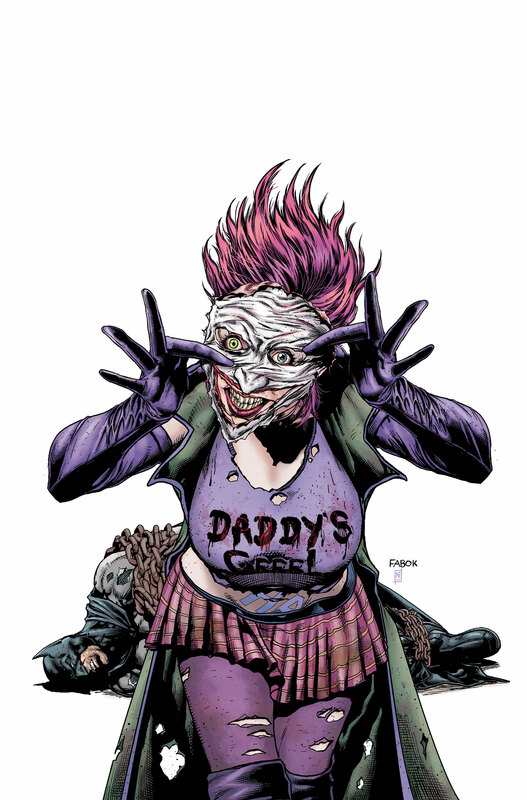 Is it Duela, her father or a mix of both? I appreciate that this issue sets up a new origin and is a great introduction for a new reader but her story is too ambiguous. Ambiguity isn’t a problem except that here it seems that wasn’t the intended effect. If Joker’s Daughter is an unreliable narrator, why are we shown such specifics of her childhood? Because of this, an issue that may have been really good became an average, forgettable, self-contained story that left me little desire to read any more of Joker’s Daughter. *This is a joke for those of us lucky enough to work in a comic store. The Joker’s Daughter issue was the most allocated book this month, making that the question I’ll (and others) will hear the most this week. Thank you DC. The artwork here is very good, showing significant storytelling abilities and strong talent. Duela wearing Joker’s face is appropriately terrifying and action is well paced and clear. The problem is again in the clarity of minor details. Duela’s scar is so minute I didn’t know it was a scar. I was dumbfounded at her father’s reaction to her birth. Sure she was a little messy but she looked liked a normal, cute baby to me. Then on my second read I noticed that tiny, off colored squiggle on her face was meant to be a birth defect. Of course, it makes its tiny appearance in only one other panel so I think I can be forgiven for that. This, mixed with the vague story, made for a confusing, choppy read. The Dark Knight #23.4 isn’t bad, it’s just an average, ok, run of the mill comic. It succeeds in introducing a new origin of the character, is new reader friendly and tells a self-contained story. Unfortunately, details in the story are unintentionally confusing, both in the art and writing, creating a reading experience much like those choose your own adventure novels. I don’t feel like I understand the Joker’s Daughter any more than when I sat down to read the issue. In the end, it’s worth reading if you have the chance but I wouldn’t be running around trying to find this issue. If you must own, save yourself the dollar and buy the 2-D cover. Of course, if you’re buying a comic just for the cover you’re probably not reading the story anyway. And no, we don’t have any in stock. Batman: The Dark Knight #23.4 gets 2.5 out of 5 stars. Unfortunately, it has nothing to do with the actual quality of the book. I wish more people would just actually read the things. I had a customer come in picking up an order with multiple copies of the 3-D covers and ask me if any of the villains titles were good. I told him my thoughts and asked his. He hadn’t read any, though he’s bought them all. Say what you will, but DC made a killing with this stunt.